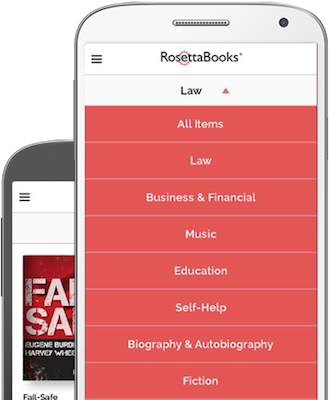 Many of you will be familiar with RosettaBooks as an E-Book publisher (producing backlist works of familiar authors ranging from Winston Churchill to Kurt Vonnegut), but now you can use their new e-reading app for mobile phones and tablets. Think of this app like a portal, allowing you to discover new titles, explore various genres (like biography/memoir, science fiction, romance, Books Into Film, bestsellers, nonfiction, literary fiction, mystery/thriller), connect with others using the app, find the ‘freebies’ (free eBooks, giveaways, and discounted titles), read sample chapters, and review all of the new releases and best sellers each week! Unfortunately, you cannot use the app to make purchases as it does not support direct sales, but you can review excerpts and information about the authors and follow links to the digital publishers’ retail partners if your interest is raised. This ‘lack of feature’ is a bit frustrating, because while the app is quite easy to use with a nicely responsive interface –there is no quick and easy way to purchase a title once you are enticed by the sample chapter (it requires some hunting around, clicking the information button for the book and then knowing to click ‘View More’ from a secondary screen which then takes you to an outside website that will then finally link you to the website you can buy it from). If you think of this app as a convenient way to electronically ‘browse the aisles’ of your favourite bookstore, you will be in a literary happy-place.